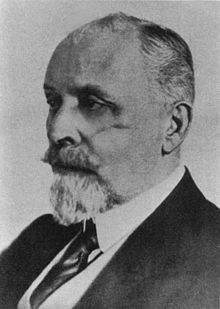 Albert Freiherr von Schrenck-Notzing (18 May 1862 – 12 February 1929) was a German physician, psychiatrist and notable psychical researcher, who devoted his time to the study of paranormal events connected with mediumship, hypnotism and telepathy. He investigated Spiritualist mediums such as Willi Schneider, Rudi Schneider, and Valentine Dencausse. He is credited as the first forensic psychologist by Guinness World Records. Schrenck-Notzing investigated the medium Eva Carrière and believed the ectoplasm she produced was genuine. However, Schrenck-Notzing did not believe her ectoplasm "materializations" were anything to do with spirits, he claimed they were the result of "ideoplasty" in which the medium could form images onto ectoplasm from her mind. Schrenck-Notzing published the book Phenomena of Materialisation in English translation (1920), which included photographs of the ectoplasm. Critics pointed out that the photographs of the ectoplasm revealed marks of magazine cut-outs, pins and a piece of string. The psychiatrist Mathilde Ludendorff wrote that the experiments of Schrenck-Notzing were unscientific and that he had been duped by tricks of Carrière. In the Schrenck-Notzing experiments with Carrière the scientific controls were scarce and there was evidence that she had freed her hands in the séance room. Harry Price wrote the photographs of her ectoplasm taken with Schrenck-Notzing look artificial and two-dimensional made from cardboard and newspaper portraits and that there were no scientific controls as both her hands were free. In 1920 Carrière was investigated by the Society for Psychical Research in London. An analysis of her ectoplasm revealed it to be made of chewed paper. She was also investigated in 1922 and the results of the tests were negative. Schrenck-Notzing admitted that on several occasions Carrière deceptively smuggled pins into the séance room. The magician Carlos María de Heredia replicated the ectoplasm of Carrière using a comb, gauze and a handkerchief. Miss Eva prepared the heads before every séance, and endeavoured to make them unrecognizable. A clean-shaven face was decorated with a beard. Grey hairs became black curls, a broad forehead was made into a narrow one. But, in spite of all her endeavours, she could not obliterate certain characteristic lines. Cut out faces that she used included Woodrow Wilson, King Ferdinand of Bulgaria, French president Raymond Poincaré and the actress Mona Delza. After Schrenck-Notzing discovered Carrière had taken her ectoplasm faces from the magazine he defended her by claiming she had read the magazine but her memory had recalled the images and they had materialized into the ectoplasm. Because of this Schrenck-Notzing was described as credulous. Joseph McCabe noted that "In Germany and Austria, Baron von Schrenck-Notzing is the laughing-stock of his medical colleagues." The Hungarian medium Ladislas Lasslo (also known as Laszlo Laszlo) confessed that all of his spirit materializations were fraudulent in 1924. A séance sitter was also found to be working as a confederate for Lasslo. Lasslo who was originally endorsed as genuine by Schrenck-Notzing was a pickpocket and army deserter. During his séances he confessed to hiding "spirit heads" made from pieces of gauze in Schrenck-Notzing's pocket or in the seat of his armchair. Karl Kraus (pseudo Karl Weber) was a medium that was exposed as a fraud by Professor Hans Thirring in Vienna in 1924. However, Kraus had been endorsed by Schrenck-Notzing as genuine. Kraus would later write a manuscript about his mediumship. He admitted that he had set out to deceive Schrenck-Notzing to reveal the inefficiency of psychical research. In 1928 Harry Price obtained the Kraus manuscript. Some of the manuscript was later reprinted by the American Society for Psychical Research and Schrenck-Notzing was charged of being a credulous investigator. In 1954, the SPR member Rudolf Lambert published a report revealing details about a case of fraud that was covered up by many early members of the Institute Metapsychique International (IMI). Lambert who had studied Gustav Geley's files on Eva Carrière discovered photographs depicting fraudulent ectoplasm taken by her companion Juliette Bisson. Various "materializations" were artificially attached to Eva's hair by wires. The discovery was never published by Geley. Eugéne Osty (the director of the institute) and members Jean Meyer, Albert von Schrenck-Notzing and Charles Richet all knew about the fraudulent photographs but were firm believers in mediumship phenomena so demanded the scandal be kept secret. ^ a b c d Carlos María de Heredia. (1922). Spiritism and Common Sense. P. J. Kenedy & Sons. pp. 186-198; Albert von Schrenck-Notzing. Materialisationsphaenomene: Ein Beitrag Zur Erforschung Der Mediumistischen Teleplastie. München: Ernst Reinhardt, 1914; Albert von Schrenck-Notzing. Phenomena of Materialisation: A Contribution to the Investigation of Mediumistic Teleplastics. trans. E. E. Fournier d'Albe. London: Kegan Paul, Trench, Trubner & Co.; New York: E.P. Dutton & Co., 1920. ^ Sommer, A. "Policing epistemic deviance: Albert Von Schrenck-Notzing and Albert Moll(1)". Med Hist. 56: 255–76. doi:10.1017/mdh.2011.36. PMC 3381523. PMID 23002296. Andreas Fischer. In the Darkroom of a Medium Researcher: Albert von Schrenck-Notzing. From The Message. Art and Occultism. With an Essay by André Breton (Ed. by Claudia Dichter, Hans Günter Golinski, Michael Krajewski, Susanne Zander. Pub. by Kunstmusem Bochum. Walther König: Köln 2007) p. 137-142. ISBN 978-3-86560-342-5. Trevor Hall (Oct 1978). Search for Harry Price. Gerald Duckworth and Company. pp. 137–147. ISBN 0-7156-1143-7. Helene Pleasants. Albert von Schrenck-Notzing. From Biographical Dictionary of Parapsychology with Directory and Glossary 1946-1996 (NY: Garrett Publications, 1964). This page was last edited on 10 December 2018, at 19:54 (UTC).